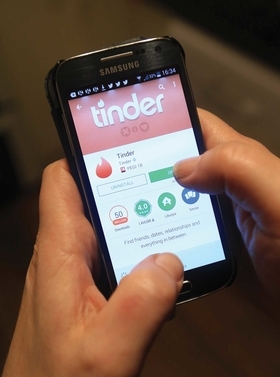 Tinder is giving app users an easy way to find STD testing sites. Tinder, one of the most popular social networking sites for those seeking casual hookups, wants to help people practice safer swiping. The dating app, which lets users swipe left or right on someone's photo to indicate whether or not they're interested, has added a link that allows people to locate places where they can get tested for HIV and other sexually transmitted diseases. The move came after the AIDS Healthcare Foundation launched a major advertising push in Los Angeles and New York City to increase awareness around sexual health and safety. Billboards and bus stop ads specifically targeted sites such as Tinder and Grindr, a similar app geared toward gay and bisexual men, prompting outrage from both sites. States such as Rhode Island have blamed the dating and hookup sites for a surge in STDs; syphilis cases in the Ocean State increased 79% between 2013 and 2014, while gonorrhea cases were up 30%. Tinder, which claims to have made 9 billion matches since it was launched in 2012, is using a test-site locator service from Los Angeles-based Healthvana. The digital health company offers services such as electronic test-result delivery.